At Haselden, our in-house virtual design and construction team creates value for your project through the ability to foresee risk through coordination of systems, 4D simulation, 5D estimates, and constructability reviews. Our process includes developing a virtual model using BIM (building information modeling) technologies that allow us to: understand constructability issues; identify and resolve interferences through clash detection; improve building quality; and plan and sequence construction efficiently. This enables us to reduce requests for information (RFIs), reduce field change orders and their resulting cost and schedule impacts, and ultimately enhance construction processes. Haselden’s VDC department is fully adept at using the most current technology in the marketplace and strives to understand workflows and processes for the lifecycle of a project in order to provide the most value to the project team. In essence, we become managers of the building information models, collecting models from design teams, subcontractors, fabricators, and specialty trades, some of which include concrete, steel, MEP, fire protection, and millwork, to ensure all plans come together cohesively. We then import model data into robotic layout equipment, allowing us to increase productivity in the field, enhance quality of installation, and ensure the precise and well-coordinated information in the model is transferred to the final product in the field. Additionally, Haselden has a full-time self-perform concrete team who prepares 3D shop drawings, lift drawings, and formwork drawings, as well as coordinates all openings and embeds. 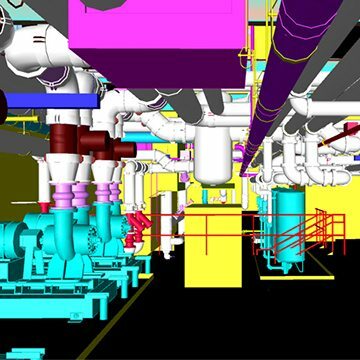 This enables our self-perform crew to operate as a high-performing team, eliminating waste through BIM technologies, and managing schedule and productivity.